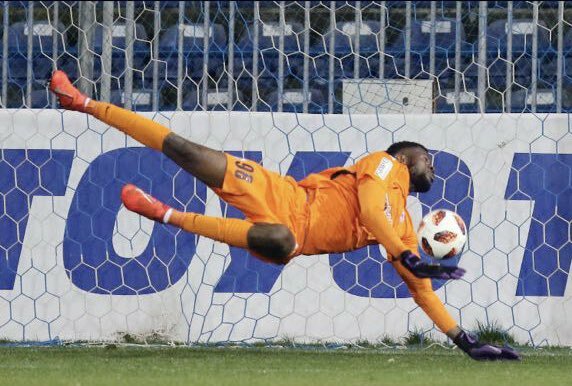 Super Eagles of Nigeria goalkeeper Francis Uzoho recorded his first win in the Cyprus League in his debut game for Anorthosis Famagusta sporting jersey #96. Uzoho left Elche after his parent club Deportivo La Coruna terminated his loan contract with the Spanish Segunda Division side. Anorthosis defeated Apollon by a lone goal from Michal Ďuriš to record a home win at the Antonis Papadopoulos Stadium and the eighth win of the season. The Great Lady seat in fifth on Cypriot First Division log with 30 points from 19 matches – 12 points behind table-toppers Apoel Nicosia. The 20-year-old who was impressive in goal stated on his official twitter handle; “It’s just a matter of when but i will definitely get there! Happy my debut came with a win and clean sheet IN CHRIST ALONE”. Uzoho will be looking for a regular feature with Anorthosis ahead of the 2019 African Cup of Nations in Egypt slated for June.